Clowns have been in the news for some time. There’s been media coverage of clowns in South Carolina and even in North Carolina where I live, in addition to many other states. In one case a man with a machete was reported to have chased one of these clowns into the woods. That incident took place in Greensboro, North Carolina, which is a mere thirty miles from where I live. So I’ve been thinking about clowns lately, despite my own skepticism regarding the phenomenon. The reports of malevolent clowns that I’ve read have characterized their activity as consisting in large part of a concerted attempt to lure people into the woods by use of candy or offers of money. 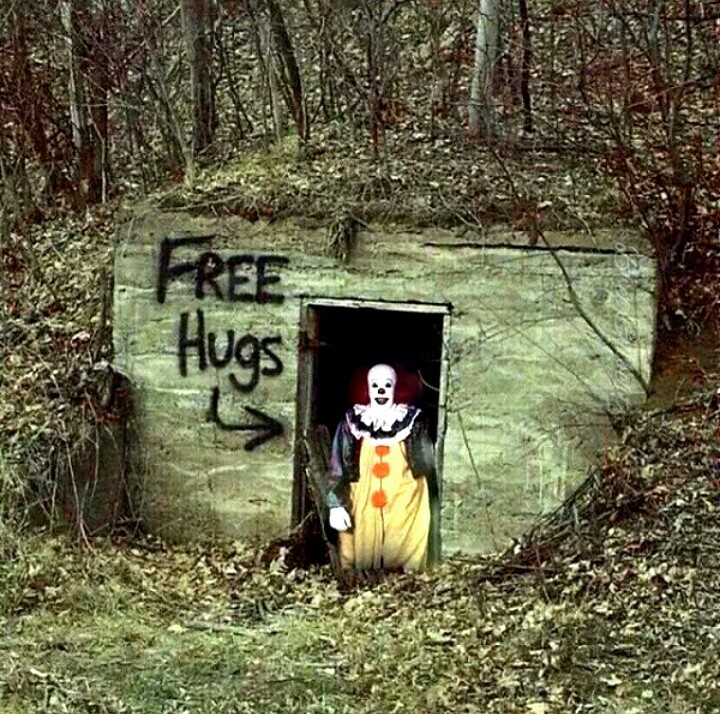 Obviously this sounds nonsensical, but the idea caters to certain preconceptions of clowns that have been prevalent on social media for some time, including this notorious meme of a clown in the woods. As you probably know by now, I love the woods. If I were to choose any place in all the world to live without any consideration of economics and with only my own happiness in mind, I would choose a forest. This probably stems from my childhood, since I grew up in a residential area that was heavily wooded, and I found myself in the woods frequently as a child. Consequently the woods are a place of familiarity and comfort for me. Or at least they usually are. With the advent of reports about clowns engaging in various sinister activities loosely related to wooded areas, my feelings have started to shift. This shift has been entirely unconscious but noticeable nonetheless. Nowhere was this shift more apparent than on a recent hike to Eno River State Park in Durham, North Carolina, which I took earlier this month. I arrived at the park around 5:30 pm and immediately scrutinized the trail kiosk to see where I would go for the day. I’d already explored the trails surrounding Fews Ford and the southern stretch of the Eno. But when I saw that there was a considerable expanse of forest to the north which I hadn’t yet traversed, I knew where I’d be heading. Setting off from the trail kiosk at the park office, I joined the Buckquarter Creek Trail. Following this, I wound my way through the surrounding hills, quickly leaving the Eno in the background and descending gradually before finding Ridge Trail. Joining Ridge Trail, I continued marching steadily northward, thankfully unconcerned about clowns for the moment. Before long, I heard the sound of rushing water ahead of me in the distance. I looked at my trusty map and determined that the sound was emanating from Buckquarter Creek itself. Reaching the creek, I looked for a bridge but instead found a line of rocks which appeared to be passable but which clearly required sure footing to cross. Before I did this, I had to take photos of the beautiful American sycamore tree (Platanus occidentalis) which graced the edge of the north side of Buckquarter Creek. Sadly the thought also occurred to me that it might be a good place for a malevolent clown to hide. After taking my photos, I gingerly hopscotched across the stream, ascended the base of the eponymous ridge, took a right at the fork in the road, and joined Shakori Trail. Judging from the depiction of the trail on the map in my hand, I figured it wouldn’t take more than fifteen or twenty minutes to complete the Shakori Trail, which loops back to Ridge Trail at its northeasternmost extremity. By now the sun was noticeably fading, and I estimated that I had thirty minutes of strong daylight by which to safely navigate these unfamiliar woods. There were, however, a few caveats. I had set out from my house without charging my phone, and it now had less than five percent power. Additionally my small digital camera which I take on hiking excursions had already died, leaving me to take photos on my phone and thereby expending more of its limited energy. Finally I had no flashlight and knew I would need to use my phone for that purpose if the woods became too dark, thereby expending more of my phone’s limited energy. All of this increased my apprehension about venturing into this stretch of woods; but I did anyway, fully cognisant that this was by far the best place in the entire park for a clown with a bad attitude to be hiding. I could immediately tell after crossing Buckquarter Creek that the woods to the north were rarely traversed by humans. The trail was narrower, there were more sticks and branches in the way, and at points the trail itself seemed to fade into the surrounding woods. Normally this wouldn’t have bothered me; but because of the lateness of the hour and my unfamiliarity with the area, I was becoming apprehensive. Thoughts of what might be lurking in the encroaching gloom didn’t help. Despite the depiction of Shakori Trail, there was a greater distance to walk than I was expecting. With every passing minute the sunlight waned, the trail continued, and my apprehension grew. It didn’t help that I happened to stumble upon the largest animal-droppings which I’ve ever seen on a park trail. I can’t say definitively what species made the deposit, but I’m guessing it was a bear. To the casual observer, however, it could easily have been the droppings of a clown. After passing the poop, I continued on my way. The trail was still climbing upward at a steady rate, indicating that I hadn’t reached the top of the ridge for which Ridge Trail is named. At the same time, the sunlight was still fading. Without warning I heard a rustling in the woods to my left. There was a declivity to that side which obscured my sight, and an image of a clown with a malicious sneer momentarily intruded on my thoughts. By this time, my stomach was fully tied in knots. Still I was determined to finish what I’d started, and no amount of rustling in the woods was going to stop me from doing that. At last the trail began to level out, and within ten minutes I saw a yellow fence-gate which marked the convergence of Shakori Trail with Ridge Trail. Relief flooded over me in an instant, but I still kept looking for clowns. From that point onward, I kept a brisk pace. It was 6:30, and I didn’t want to extend my stay any longer than absolutely necessary. The woods were darkening noticeably by this time, and decreased visibility only increased the play of imagination. Every darkened corner of the woods seemed to be the perfect hideout for a clown; every rustle in the branches seemed to be the approach of a clown. I tried to scour these thoughts from my mind, but they simply wouldn’t leave. At last I made it back to Buckquarter Creek. I quickly hopscotched across and felt a wave of relief at the prospect of being back on a section of trail that was reasonably well traversed by other hikers. To my left, however, there was a deserted cabin in the woods, which under the circumstances didn’t require a significant leap of imagination to be perceived as a potential hideout for a malevolent clown. With the last stretch of trail in front of me, I saw motion ahead. Immediately my stomach was in my mouth. I’d been thinking of clowns for so long that the first thought to jump into my mind was of course the worst. I was tense and uneasy but continued. Finally I could make out the features of the approaching entity. I relaxed as soon as I did. It turned out to be just another hiker with his dog at his side and his baby on his back. Finally I was done with the trail, and I got back into my car to head home. There’d been no encounter with clowns, no molestation from clowns, no sinister offers from clowns, no lurking or skulking of clowns. It’d been a good hike, even if I hadn’t arrived as promptly as I should have or with appropriate preparedness of electronic devices. In short, nothing bad had happened. And this was when it dawned on me. The most harmful effect of recent media coverage of clowns in the woods has been the effect on people’s relationship with nature. Woods have been vilified once again as sites of malevolence, perversion, and violence. This vilification is nothing new, as anyone who’s familiar with the story of Little Red Riding Hood can attest. But the disparaging misrepresentation of clowns in the woods continues the trend and takes it to another level, adding an element of infantilizing terror to the experience and further dissuading anyone, especially children, from ever taking that first step into the embrace of nature. And that’s the real horror story.